Transform Your Body with No Downtime! CoolSculpting allows you to target and remove unwanted fat. It can help transform your body by removing fat cells safely from the body. As the fat cells crystallize, they break apart and the body naturally reabsorbs them, until they are gradually eliminated from the body. Patients can see results as early as 3 weeks, although optimal results are evident between one and three months. Ready to Show More of Less? With little to no down time, CoolSculping, treatments are tailored to target the specific areas of fat that are bothersome to you. CoolScuplting is completely non-invasive and performed in our office. Each treatment takes as little as 45 minutes, leaving you free to enjoy the rest of your day and even return to work. 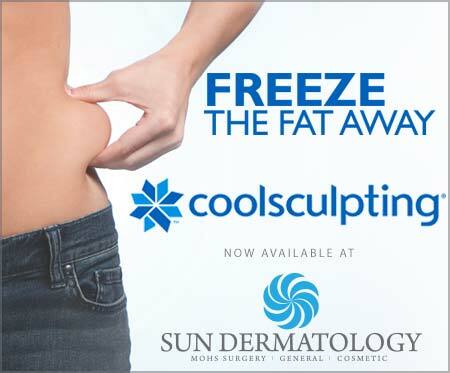 Sun Dermatology offers the latest CoolSculpting technology, proudly providing the most recent CoolSculpting machine and applicators. 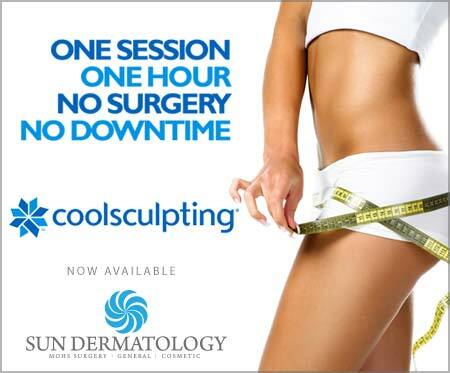 For more information on CoolSculpting in Panama City or to schedule an appointment, contact our office today.